Posted by OromianEconomist in Dictatorship, Free development vs authoritarian model, Knowledge and the Colonizing Structure., Language and Development, NO to the Evictions of Oromo Nationals from Finfinnee (Central Oromia), Oromo and the call for justice and freedom, Oromo Identity, Oromo Protests, Oromo the Largest Nation of Africa. Human Rights violations and Genocide against the Oromo people in Ethiopia, State of Oromia, The Colonizing Structure & The Development Problems of Oromia, The extents and dimensions of poverty in Ethiopia, The Tyranny of Ethiopia. In 1941 Selassie passed a decree to ban the Oromo language, [Afan Oromoo]. His bias against the Oromo became readily apparent when he went so far as to forbid them from speaking their own language. The emperor followed this in 1944 with Decree Number 3, which required all missionaries to teach in Amharic, despite the fact that the majority of the Oromo and other ethnic minorities did not speak the language. According to the decree, The general language of instruction throughout Ethiopia shall be the Amharic Language, which language all missionaries will be expected to learn. Selassieís government entrenched the Abyssinian culture further by making Amharic the national language of Ethiopia in 1955. During the early 1970 the regime recognized and used four other languages (Tigrinya, Tigre, Somali, and Afar) but not Oromoo afan, thereby demonstrating the leaderís level of disdain for the Oromo. The concept of Oromo peace also influenced their beliefs regarding the social development of humanity (finna), which they believed passed through five stages to reach the nagaa oromoo. They called the first stage the gabbina, where humanity learned from their past mistakes to create the gada system. After this stage they progressed to the ballina, which involved greater cooperation between them and increased wealth. The badhaadha marked the third stage, where unity and tranquility persisted among the Oromo, which pleased Waqa. After humanity had made peace with itself, it next made peace with nature, represented by the hoormaata stage. Finally, the daaga was the level on which humans integrated all lessons learned from previous stages in order to live in perfect harmony. on published works by the Oromo themselves. The government of Haile Selassie and the CMF had different views on the proper role of missionary work in Ethiopia. Selassie saw the missionariesí role as being utilitarian, aiding his overall objective of the unification of Ethiopia. However, the CMF saw their primary goal as spiritual, saving the Oromo from a life of sin through the acceptance of Christianity. Neither agenda had as its primary goal elevating the depressed sociopolitical and economic levels of the Oromo society. The question arises regarding the success of the CMF in evangelizing to the Oromo and the extent to which the Oromo benefited from CMF efforts. Related to this is the manner in which the Amhara-dominated government and Ethiopian Orthodox Church responded to the success of the CMF. ‘Abyssinians commenced the political unification of Ethiopia in the middle of the nineteenth century by destroying the sociopolitical and religious institutions of the Oromo. In 1852 the Amhara, under Dejazmatch Kassa (who later became Emperor Tewodros), defeated the most powerful Oromo city-state controlled by Ras Ali. ‘Haile Selassie’s ascendancy to the throne marked the beginning of perfected efforts by the Abyssinian government to pacify the Oromo. Selassie wanted to create a unified Ethiopian state under his control and devised several means to accomplish this goal.Through a project called Teklay Gizat (pulling together) he attempted to manufacture an Ethiopian identity with a campaign of uniting all disparate peoples. Selassie’s effort to centralize his power and create a new national identity manifested in many forms. In his philosophical outlook the Abyssinian culture, particularly that of the Amhara and Orthodox Christianity, represented his concept of Ethiopia and, under him, being Ethiopian became synonymous with accepting his view of Abyssinian culture. The emperor expressed this sentiment in public speeches throughout his reign. In a 1959 college speech Selassie clearly expressed this sentiment: The Amhara race must know that it has an obligation on its part to work in the technical field no matter at what level. To preserve the heritage of one’s honor and culture. This statement indicates that, for Selassie, being Ethiopian meant being Amhara. The emperor continued to express the belief that being an Amhara Orthodox Christian represented the qualities of Ethiopians when he stated on 15 January 1965, Ethiopia, an island of Christianity, has made her own distinctive contribution to the Christian faith; forever since her conversion to Christianity she has remained faithful, her age-old ties with the apostolic church uninterrupted. This shows that Selassie believed that Orthodox Christianity represented all of Ethiopia’s peoples and their non-Christian religions. In his Ethiopia, no room existed for people who did not assimilate to the Abyssinian culture and religion. ‘During the 1900s to the 1940s the Oromo reacted to Abyssinian imperialism by applying their traditional societal flexibility, which allowed them to adapt easily to new situations. Most non-Muslim Oromo accepted the mass conversion to Orthodox Christianity and wore circles around their neck to symbolize their acquiescence. Posted by OromianEconomist in Africa, Africa Rising, African Poor, Free development vs authoritarian model, Gambella, No to land grabs in Oromia, NO to the Evictions of Oromo Nationals from Finfinnee (Central Oromia), Omo, Omo Valley, Oromia, Poverty, The Colonizing Structure & The Development Problems of Oromia, The extents and dimensions of poverty in Ethiopia, The Tyranny of Ethiopia, Uncategorized, Youth Unemployment. (OPHI) –The Global Multidimensional Poverty Index (MPI), published by Oxford University reveals that Ethiopia ranks the second poorest country in the world and Africa, just ahead of Niger. The study is based on analysis of acute poverty in 108 developing countries around the world. Despite making progress at reducing the percentage of destitute people, Ethiopia is still home to more than 76 million poor people (out of total population of 87 million). 87.3% of Ethiopians are classified as MPI poor, while 58.1% are considered destitute. Oxford University says poverty is not just about a lack of money. It’s also about not having enough food, education, healthcare and shelter, and some poor are much worse off than others. A person is identified as multidimensionally poor (or ‘MPI poor’) if they are deprived in at least one third of the weighted MPI indicators. 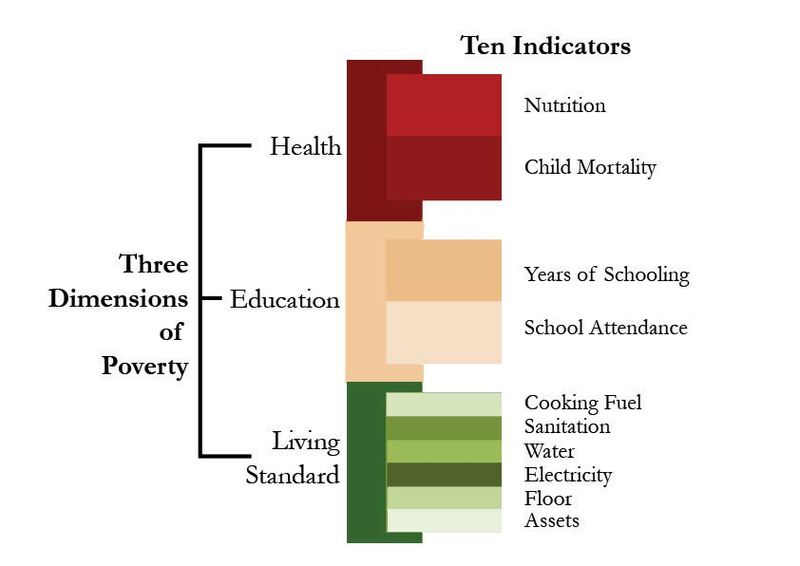 The destitute are deprived in at least one-third of the same weighted indicators, The Global MPI uses 10 indicators to measure poverty in three dimensions: education, health and living standards. In rural Ethiopia 96.3% are poor while in the urban area the percentage of poverty is 46.4%. see Alkire, Conconi and Seth (2014), available at: http://www.ophi.org.uk/multidimensional-poverty-index/. A person is identified as multidimensionally poor (or ‘MPI poor’) if they are deprived in at least one third of the weighted indicators shown above; in other words, the cutoff for poverty (k) is 33.33%. The proportion of the population that is multidimensionally poor is the incidence of poverty, or headcount ratio (H). The average proportion of indicators in which poor people are deprived is described as the intensity of their poverty (A). The MPI is calculated by multiplying the incidence of poverty by the average intensity of poverty across the poor (MPI = H x A); as a result, it reflects both the share of people in poverty and the degree to which they are deprived. See more @ Oxford and Human Development Initiative (2014). “Ethiopia Country Briefing”, Multidimensional Poverty Index Data Bank. OPHI, University of Oxford. Available at /. production possibilities, and exchange conditions among others (Sen, 1981). underpinned by what is known as a crisis in endowments and production possibilities. Posted by OromianEconomist in Africa, Africa Rising, African Poor, Amane Badhaso, Colonizing Structure, Corruption, Dictatorship, Environment, Ethnic Cleansing, Finfinne is Oromia's land, Finfinnee is the Capital City of Oromia, Finfinnee n Kan Oromoo ti, Free development vs authoritarian model, Genocidal Master plan of Ethiopia, Human Rights, Human Rights Watch on Human Rights Violations Against Oromo People by TPLF Ethiopia, Janjaweed Style Liyu Police of Ethiopia, Jen & Josh (Ijoollee Amboo), Knowledge and the Colonizing Structure. African Heritage. The Genocide Against Oromo Nation, Land and Water Grabs in Oromia, Language and Development, Nimoona Xilahuun Imaanaa, Nimoonaa Tilahun, No to land grabs in Oromia, No to the Addis Ababa Master Plan, NO to the Evictions of Oromo Nationals from Finfinnee (Central Oromia), Ogaden, OMN, Omo Valley, Oromia, Oromia wide Oromo Universtiy students Protested Addis Ababa Expansion Master Plan, Oromians Protests, Oromiyaa, Oromo, Oromo and the call for justice and freedom, Oromo Identity, Oromo Nation, Oromo Protests, Oromo Protests in Ambo, Oromo students movement, Oromo students protests, Oromo the Largest Nation of Africa. Human Rights violations and Genocide against the Oromo people in Ethiopia, Oromo University students and their national demands, Poverty, Say no to the expansions of Addis Ababa, Sidama, State of Oromia, Stop evicting Oromo people from Cities, The Colonizing Structure & The Development Problems of Oromia, The extents and dimensions of poverty in Ethiopia, The Mass Massacre & Imprisonment of ORA Orphans, The Tyranny of Ethiopia. In mid-2012 theAddisAbeba City Administration (AACA) has organized a project office called “Addis Ababa City Planning Project Office” and tasked it to prepare a city development plan that it claimed would work for the coming ten years. In the middle of the process, however, the Project Office was givenanadditional mandate of preparing a plan that instead should suit a metropolitan level. It was then that the project expanded its planning boundary toincludethe whole surrounding area ofAddisAbeba – covering as far as 40 to 100 kilometers in an area as big as 1.1 million hectares of land. As these surroundings belong toandare administered by the Oromia National Regional State (ONRS) a supervisory body from theregionwas established to oversee the activities of the project office. It comprised big namesincludingAbdulaziz Mohammed, deputy president oftheONRS andAsterMamo, deputy prime minister in the governance and reform cluster.The Project Office had also brought on board people from the Oromia Urban Planning Institute.Many of the Oromia regional state senior officials were enthusiastic about the idea of organizing a joint metropolitan plan and the project office was re-named ‘Addis Abeba and the Surrounding Oromia Special Zone Integrated Development Plan Project Office’.One of the achievements of Abbaaduula Gammadaa’s tenure as president of ONRS was the amalgamation in 2008 of Addis Abeba/Finfinne surrounding districts and municipalities into a single Special Zone found within 30 kilometers radius of the city of Addis Abeba. Immediately after the establishment of the Special Zone, ONRS commissioned a Regional Plan that was finalized in 2010. The Oromia regional state officials had offered this regional plan to be incorporated with the proposed metropolitan plan commissioned by the AACA. What went wrong, where and when? The grand plan that was warmly welcomed by ONRS senior officials failed to attract the same reception from the lower and mid-level political leadership of the Special Zone as well as local governments within the zone. Most of them were skeptical and some viewed it as an effort to annex the Special Zone of Oromia into Addis Abeba. There were few incidents where Oromia regional state officials refused to cooperate with the Project Office in making information necessary for the planning process easily accessible. The Project Office, too, has done little to establish trust among the Special Zone and ONRS mid and lower level officials. Trust between the two had reached rock-bottom when the Project Office developed what it said was a spatial plan without involving mayors of the municipalities as well as other officials in the metropolitan area and relevant regional and Special Zone officials. In June 2013 the Project Office unveiled a readymade draft metropolitan plan in Adama town, 100km east of Addis Abeba and the capital of the ONRS, that determined, among others, the locations of waste treatment, landfill sites, industrial zones, and transportation corridors. Once again the draft metropolitan plan was welcomed by the top Oromia regional state leadership; but it left the rank and file officials disgruntled. Most of them considered it (perhaps rightly) as a violation of their autonomy. However, since the top leadership has given the grand plan its blessings the Project Office went ahead with it. Things went vividly out of control during a meeting between officials of the Oromia regional state and the Addis Abeba city administration representatives held in Adama town on March 26 and April 12-13.The questions raised in these meetings revealed that the Project Office has failed to build trust on the motive of the Master Plan let alone actively involve the ONRS officials in the planning process. What happened with the preparation of this master plan was an approach that gave strategic planning and political inclusiveness a zero chance. Five fundamental problems highlight the plan. First, this master planning approach viewed planning as a mere technocratic process and the planner as the chief architect of the spatial area that comes up with a readymade blueprint that everyone is expected to accept. Strategic spatial planning is as much of a political process as it is professional; it requires the active involvement of political leadership, major urban or regional actors-including the private sector, community organizations and civil society groups. In addition, the planner’s role should mainly be as a facilitator and a negotiator among the diverse actors who have conflicting (and competing) interests. There was groundbreaking effort to shift urban planning culture to a more strategic and inclusive approach in the 2002-12 City Development Plan of Addis Abeba. In the two year planning process, for example, over 150 workshops and consultative meetings with a wide range of stakeholders, including a city exhibition and public forum, were organized. That is something the current master plan project lacked; it has organized not more than nine consultative workshops. A grand plan such as this need to be owned as much by politicians and their constituency as by professional urban planners. The only way to do this is if the authorities and the public were involved actively in the planning process. Nevertheless, the Project Office single-handedly decided where to locate the waste treatment, the land fill site or the industrial zone with no formal consent from the respective local government officials who are supposedly the elected representatives of the constituencies in the areas affected by the plan. It was a planning process that gave way to the infamous planning syndrome known as Not in My Backyard (NIMBY). When a planner decides to put a waste treatment in one district, the least s/he needs to do is negotiate with the respective district authorities on how to mitigate the negative externalities. With the new master plan, nothing of this happened, compromising the constitutionally guaranteed autonomy of the Oromia regional state and the Special Zone to make decisions that affect their constituency. Second, it failed to secure the legitimacy for joint planning. The reason for the suspicion by many low and middle level officials of the ONRS is twofold. The first one is metropolitan planning in Ethiopia is unheard of and Addis Abeba’s administrative boundary has been expanding for the last century, in which the latest one has more than doubled its jurisdiction in 1994. It is, therefore, totally understandable if ONRS officials and concerned citizens fear the encroachment of the Special Zone by the capital city. The second reason is the project office kept most of the process secrete. Third, amalgamation of municipalities into one gargantuan metropolitan government has lost credence since the late 1980s and new forms of metropolitan cooperation are promoted in lieu of annexation. However, the project office failed in clarifying its intention and mobilizing support from the Oromia region officials and other stakeholders due to its closed door planning process. Fourth, and the major limitation of the process is the composition of the planning office. As it was mentioned above the project office was initially commissioned by AACA to prepare a city development plan for Addis Abeba. The same planning team was tasked to develop a metropolitan plan with the exception of the recruitment of a handful of former Oromia Urban Planning Institute staff. Less than 10 planners from close to 80 technical staff of the project office cannot ensure Oromia’s interest, the largest and most populous region of the country, in the metropolitan plan. The majorities of the planning team members are born in Addis Abeba or have lived in the city for long or were former staff members of the Addis Abeba city administration, which makes them perfect candidates for sentimental compromise against the interests of the Oromia region. And finally, the top leadership of ONRS welcomed the draft metropolitan plan regardless of opposition from their subordinates as well as the wider public. The stubbornness of the ruling party, which is seen in other policy arena, was also visible in this planning process. The government, rather than accommodating the reservation of various individuals and groups on the plan or on its motive, chose to label those who complained against the plan as working for the so-called obscure “anti-peace agents”. This was the major reason that led to the widespread protest in many Universities and several towns in Oromia, which claimed the lives of eleven people by the account of the government (other sources put the death as high as 49) and resulted in countless property damages. (Please see A new master plan:Complicated-turned-deadly). Many people may believe it may be already too late. But there are things one can do to reverse courses. The first step is to establish a taskforce, which comprises ONRS officials, Special Zone officials, Mayors of the eight municipalities of the Special zone together with the Regional Urban Planning Institute planners or commissioned consultants, to review the draft metropolitan and suggest recommendations that ensure Oromia’s interest. This taskforce in turn needs to consult with the civil society, the private sector, opposition party members, residents of the Special zone, University students and other concerned bodies in its reviewing process. The second and perhaps the most important one, is clarifying the provisions of Art. 49(5) of the country’s constitution by a federal proclamation before signing the metropolitan plan into a law; the metropolitan plan need to be used as an instrument to materialize the constitutional provision of the country. Third, and most sensitive, should be bringing before justice those who ordered the killings of the students who were protesting against the plan as well as those who executed the orders. Posted by OromianEconomist in Africa, Amane Badhaso, Ambo, Colonizing Structure, Ethnic Cleansing, Finfinnee is the Capital City of Oromia, Finfinnee n Kan Oromoo ti, Genocidal Master plan of Ethiopia, Land Grabs in Africa, Oromia, Oromian Voices, Oromians Protests, Oromiyaa, Oromo, Oromo and the call for justice and freedom, Oromo Diaspora, Oromo Nation, Oromo Protests, Oromo Protests in Ambo, Oromo students movement, Oromo students protests, Say no to the expansions of Addis Ababa, State of Oromia, Stop evicting Oromo people from Cities, The Colonizing Structure & The Development Problems of Oromia. The brutal crackdown on the Oromo people is not new. The Ethiopian state itself has been predicated upon the expropriation of Oromo lands and held together through violent assimilationist policies, the destruction of the identity of conquered and resistant people, and economic and political exploitation of groups who are not represented in government. With each changing regime state power has been retained in the hands of minority rulers and the Oromos, who are the largest group living on the richest land, have remained the main targets of Ethiopian state repression, terrorism and discrimination. Over the last two decades alone multiple human rights organizations have released reports documenting the extent of extrajudicial killings, mass imprisonment, and torture on a massive scale, mutilations and disappearances. For instance, as of May 2012, the Oromia Support Group reported 4,407 extra-judicial killings and 992 disappearances of civilians perceived to support the political and even social groups opposing the current regime. Most of these have been Oromo people. The crisis in Ethiopia is a major international story of mass protest, wholesale dispossession of millions of peasants, and state-sponsored violence. Yet it has gone almost completely ignored in the international media. There are a number of reasons the story hasn’t grabbed attention around the world—the situation’s complexity, the tight control of information by Ethiopian authorities, and western journalists’ unfamiliarity with Ethiopia’s tense ethnic politics, to name just a few. But the bigger issue has to do with Western media bias. lands. Even though the country’s constitution theoretically allows for peaceful demonstrations, the student protesters, along with local populations in many cities and towns, have faced a ruthless crackdown from Ethiopian Special Forces, known as the Agazi Commandos. These forces have used excessive violence by indiscriminately shooting into crowds in an attempt to quash the protests. Children as young as eleven years old have been killed, according to statement issued by Amnesty International on May 13, and reports of fatal injuries, torture, imprisonment, disappearances and killings have been coming out of Ethiopia since then. The Ethiopian government has evicted millions of indigenous peoples from their homelands at gunpoint under the pretext of “development” since it took power. In and around the capital of the country, Addis Ababa, over 200,000 of these residents have been removed from their lands without proper compensation since 2005. The newly-announced Integrated Development Master Plan for Addis Ababa (known simply as the “Master Plan”) seeks to legalize past land grab activities and to consolidate larger areas of territory displacing native peoples from their land. The Master Plan will expand the territory of Addis Ababa city administration to about 25 times its current size and is expected to forcefully remove another four to five million Oromo peasants from their lands within the coming years. The current Ethiopian government came to power in 1991. It is a government dominated mainly by elites from a single ethnic group, the Tigray, which constitute approximately six percent of the peoples within Ethiopian boundaries. The Oromo, who are targeted by this Master Plan, make up between 40-50 percent of the population. The Ethiopian Agazi special Commando force is almost entirely Tigrayan. The government relies on this ethnic army to stamp out the Oromo protests. The current crisis cannot be understood apart from the ethnic dynamics at play in the policy of the Master Plan and in its response. In the Ethiopian political, social and economic system, ethnicity and language are the two most important factors which influence policy preferences and choices of different sectors or communities in Ethiopia. It is also along these two dimensions that the Ethiopian state has been structured since the current regime came to power. In recognition of these factors, a formal system of Ethnic Federalism has been instituted and written into law as the centerpiece of the Constitution of the Federal Democratic Republic of Ethiopia. Oromia, where most Oromos reside, is legally recognized as one of the nine members of the Ethiopian Federation. In practice, however, all the key government positions and institutions are controlled by elites—directly and indirectly—that come from the Tigrayan ethnic group. Key positions in security sectors, including the military, are exclusively under the control of Tigrayan rulers. It is this group of elites that have aggressively pursued policies that have drawn on the military might to remove Oromo peasants involuntarily from their homeland over the last decade or more. The new Master Plan for Addis Ababa should be seen in this context, as the protestors well understand. The Master Plan is one more chapter in implementing a disastrous policy that has already displaced thousands of the native peasants, and now officially aims to displace millions more. This is the policy against which Oromo students have gone out to protest. In keeping with their former legacy of sheer brutality, the Tigrayan ethnic armed force, the Agazi, responded to peaceful gatherings with a rain of bullets. It is within this context that the current violent response to Oromo protests should be understood and appreciated. Like it has always been, kidnappings and/or extrajudicial killings, arbitrary arrests and disappearances continue in different parts of Oromia Regional State. Those being imprisoned face an imminent danger of death, torture or disappearance. Yet despite the fact that the situation is quickly deteriorating, it is going largely unreported in the international media. The Ethiopian government is notorious for keeping very tight control over all local and international media in the country. Information is not easily attainable. Independent journalism and human rights monitoring are securitized and criminalized. Major restrictions remain on exchange of information, as the government is known to block almost all websites it regards as forums capable of providing information about the atrocities committed by its security agents. These include all independent websites that are situated both in and outside of Ethiopian territories. Given these circumstances, it has not been possible to determine the exact number of victims of the recent retaliation against Oromo protesters. But thanks to social media and mobile technology, a view of the scale of the crisis is emerging. Some human rights organizations have managed to get limited information and offer an insight regarding what is taking place as the protests continue. For instance, according to the above-mentioned statement released by Amnesty International, hundreds of those arrested during the protests have been held at different detention centers, including at unauthorized places such as police and military training camps. Detention in these places is almost always arbitrary, with prisoners spending months and years without being formally charged or taken to a courtroom. As the Amnesty International report notes, “military camps in Oromia have regularly been used to detain thousands of actual or perceived government opponents.” These detainees are not allowed access to lawyers or relatives, usually throughout the duration of their detention. In many instances, relatives do not know where their loved ones have been taken upon arrest. Human rights organizations, including Amnesty International have received reports of torture on a massive scale at these unofficial holding places. In addition to Amnesty International, other human rights organizations have also released statements of concern that recent detainees face imminent risk of torture and abuse, if not death. Human Rights Watch reported that security forces beat and shot at peaceful Oromo protesters in many towns in Oromia Regional State, among others, Ambo, Nekemte, Gimbi and Jimma. The Human Rights League of Horn of Africa has also issued a report citing torture and disappearances in places where student protesters are being held in Naqamte, East Wollega zone. In one instance alone, fifty detainees were taken away by security forces in Naqamte. Their whereabouts remain unknown. The crisis in Ethiopia is a major international story of mass protest, wholesale dispossession of millions of peasants, and state-sponsored violence. Yet it has gone almost completely ignored in the international media. To be sure, the story has attracted fleeting attention from English-language outlets like the BBC and the Guardian, while Al-Jazeera has curated what little information trickles out of the country from social media users on the ground. But sustained analysis of the causes and context of the government’s plan, the protests in response and the violent government crackdown have been hard to come by. There are a number of reasons the story hasn’t grabbed attention around the world—the situation’s complexity, the tight control of information by Ethiopian authorities, and western journalists’ unfamiliarity with Ethiopia’s tense ethnic politics, to name just a few. But the bigger issue has to do with Western media bias. Over the years, a considerable amount of attention has rightly been given to bloggers and journalists whose individual rights have been violated by the Ethiopian government. This is not surprising. It is easy to sympathize with those trying to practice their freedom of expression or tell a difficult story in the face of authoritarianism. The repression of media in a given country is an easier account to give, and it is a simpler story to process. The miseries and violence of the other repression—that against the voiceless masses—cannot afford to be get lost in the shuffle, as the situation in Oromia makes clear. As long as this bias remains salient, the deaths of hundreds, possibly thousands, will continue to go unreported and unrecognized, and the cause for which so many have sacrificed will remain hidden. *Ayantu Tibeso is a researcher and communications consultant based in North America. She can be reached at atibeso@gmail.com or on twitter @diasporiclife. Posted by OromianEconomist in Africa, Africa Rising, African Poor, Agriculture, Climate Change, Colonizing Structure, Food Production, No to land grabs in Oromia, No to the Addis Ababa Master Plan, NO to the Evictions of Oromo Nationals from Finfinnee (Central Oromia), Omo Valley, Oromia, Poverty, The Colonizing Structure & The Development Problems of Oromia. The scale of foreign agribusiness on African soil could soon change how what we eat is grown, but also what we eat. The livelihoods of small-scale farmers hang in the balance. But a counter movement is forming. Meet three warrior queens battling for Africa’s food future. Africa is at a tipping point – soon the scale of foreign agribusiness on African soil could change who owns vast tracts of land, how food is grown there and what the average person will consume. The livelihoods of small-scale farmers who work family farms, which still make up 80 per cent of Africa’s farms, hang in the balance. The major actors in this drama are unsurprising: Monsanto, Unilever, Diageo, Cargill and their peers. All have identified sub-Saharan African, with its fertile lands and budding consumer markets, as a place of great opportunity, rich for the picking – African countries are not referred to as ‘frontier economies’ by the West for nothing. Many African governments have signed up to this agenda. Some buy into the notion that large scale agribusiness will bring food security, others that it will bring their country economic growth, others still are just content with the short-term financial gain that such investment often brings. So if the political representatives of these countries will not man the barricades, who will? The good news is that, while many of the youth of Africa have joined in the clamour for KFC and Subway and see fast food as a way of belonging to global (or American) culture, others are forming movements to protect and promote real food. While in Western economies, the consumption of fast food is often seen as a sign of poverty, and organic, fresh food a sign of middle-class identity, in many African economies it is the other way round. Your ability to stump up the cash for a junk food ‘brand’ is a sign of membership of what is in numerical terms still a small elite, whereas the cash-poor and rural dwellers will tend to a healthier diet of, for example, beans and maizemeal. Beside the socio-economic picture, there is also the threat of climate change, already being felt clearly in many parts of Africa in the form of flooding, drought and desertification. Large-scale agribusiness with synthetic inputs would likely exacerbate the situation – whereas Africa still has the chance to lead by forward-thinking example. If there is anywhere in the world with the opportunity to combine natural, small-scale food production and distribution with clean technology, it’s this fertile continent. Three female food warriors taking centre stage in this battle are Kenya’s Professor Mary Abukutsa-Onyango, Tanzania’s Janet Maro and South Africa’s Mariam Mayet. Between them they are teaching the health benefits of Africa’s own indigenous plants, promoting the advantages of organic agriculture, and fighting the incursions of the multinationals into Africa. Professor Mary Abutukutsa-Onyango is professor of horticulture at Jomo Kenyatta University in Kenya. Professor Abukutsa-Onyango has been advocating the consumption of indigenous African plants for two decades now. She says Africans have forgotten about some of the local plants that offer the greatest nutrition of all – such as jute mallow, spider plant and amaranthus. These plants offer a health kick that makes spinach look about as nutritious as chips, she explains. If she has her way an indigenous food revolution is on its way, and those with green fingers might like to try growing and cooking these plants themselves. Janet Maro is the founder of Sustainable Agriculture Tanzania. At 26, Janet Maro may be relatively young but she is making a serious impact. A former agriculture student herself, she identified a need for farmers to be trained in organic agriculture in order for them to be independent and have food sovereignty – choice and control over their own food production. Telling the tale of the first group of farmers that she went to visit in a bid to prevent deforestation and slash-and-burn practices, she sadly jokes that they didn’t believe she was for real, because she hiked to see them rather than turning up in a fancy vehicle. She runs a residential centre near Morogoro for farmers (and others interested in organic farming) where people can be taught the principles of chemical-free growing, intercropping and more. Like Professor Abukutsa-Onyango she has found several plants in her work with interesting nutritional, medicinal or farming uses. While her work is positive and rewarding, she’s not afraid to emphasise the negative – for example, the issue of village land that has been used by families for generations being allocated for foreign investment, as formal proof of ownership does not exist in these unsurveyed areas. Kilombero and Ifakara, home of Tanzania’s most famous rice, are cases in point, she says, and she’s concerned that the future of the rice and those who farm it is in jeopardy as much of this land has now been demarcated for investment. Mariam Mayet is the executive director of the African Centre for Biosafety in South Africa. Since the late 1990s, Mayet has been campaigning against genetically modified seeds and food, and she set up the African Centre for Biosafety to fight the introduction of GMOs in South Africa as well as monitoring the development of policy elsewhere on the continent. South Africa, unlike most other African countries, is already far down the line when it comes to the industrialisation of agriculture. “Just a few big boys get to play in the system, giving them a lot of power over what is available on the market at what prices,” says Mayet. What are the solutions? They’re complex, she says, but include access to land and water as a fundamental. There is also a need to help smallholders collectively break the stranglehold of the big supermarket chains. Often persecuted urban street vendors can actually be key to making fresh, local produce available to those who commute or work long hours. It seems odd that food, such a central part of our lives, and farming, such a core African livelihood, have taken such a low political profile. Where they are talked about, the concept of ‘food security’ is being used as a Trojan horse to persuade many nations to swallow the pill of land takeovers by foreign firms and pressure on small-scale farmers to adopt GM seed and chemical fertilisers to fill the coffers of their makers and IP owners. Posted by OromianEconomist in Colonizing Structure, Corruption, Dictatorship, Finfinne is Oromia's land, Finfinnee, Finfinnee is the Capital City of Oromia, Finfinnee n Kan Oromoo ti, Free development vs authoritarian model, Genocidal Master plan of Ethiopia, Land and Water Grabs in Oromia, No to land grabs in Oromia, No to the Addis Ababa Master Plan, NO to the Evictions of Oromo Nationals from Finfinnee (Central Oromia), Ogaden, Omo Valley, Oromia wide Oromo Universtiy students Protested Addis Ababa Expansion Master Plan, Oromian Voices, Oromians Protests, Oromiyaa, Oromo Culture, Oromo Diaspora, Oromo students movement, Oromo students protests, Oromo University students and their national demands, Oromummaa, Sidama, State of Oromia, Stop evicting Oromo people from Cities, The Colonizing Structure & The Development Problems of Oromia. The so-called Addis Ababa Master Plan (AAMP) has ignited an Oromia-wide protest involving university and high school students. The TPLF-led Ethiopian regime has responded to the peaceful protests staged by Oromo students against the plan with tanks and live ammunition, killing dozens in the crowds. The protest, which started on April 24, 2014 at Jimma University, is joined, not only by tens of thousands of the students of all the universities in Oromia, but also tens of thousands of high school students and members of the local population in many cities, towns and villages. The voice of this massive Oromo rally against the AAMP cannot be silenced by bullets and tanks as in the past. It concerns, not only the cause of the Oromo farmers in Central Oromia, whose livelihoods will be affected by the AAMP, but also that of all the Oromo farmers and pastoralists throughout Oromia whose farms and pasturelands have already been sold and are targeted to be sold to land grabbers by the present Ethiopian regime. In short, it concerns the survival of the Oromo as a nation. It is important to note that that conflict over the AAMP is an extension of the conflict which was ignited by the 2003 decision of the TPLF regime to evict Oromo institutions from Finfinnee (Addis Ababa) city and relocate them to Adama, a town about 100km to the southeast. Then, the Oromo attempted to stop the eviction with peaceful protest, but were met with atrocities by the TPLF regime. Leaders of the Maccaa Tuulama Association (MTA) and university students, who organized that protest, were arrested and jailed. The property of the MTA, a self-help organization which was established in 1963, was confiscated outright by the government. More than 300 students were expelled from the Addis Ababa University alone. Regrettably, the struggle over Finfinnee which started 11 years ago is not over. The impunity of the TPLF regime, as reflected in the killings of many students who opposed so-called Addis Ababa Master Plan, has continued. The TPLF regime was forced to halt the eviction of Oromo institutions from the city in 2005 under pressure from both Oromo and non-Oromo opposition. That did not mean that Finfinnee was made to serve the Oromo people. In reality, the regime did not withdraw its decision, and the struggle over Finfinnee was not concluded. For unknown reasons, the Oromia Regional State did not build Oromo institutions in the city during the last two decades. Finfinnee (Addis Ababa), which is constitutionally the capital city of Oromia, is without a single public school that uses the Oromo language as a medium of instruction or a single newspaper which is printed in Afaan Oromoo. All of the newspapers which were started in the early 1990s were banned, and their journalists were in jail or in exile by the end of the decade. To paraphrase what the young Oromo artist Jaafar Yuusuf has expressed with poetic eloquence and for which he was detained and tortured, Finfinnee is the capital city of Oromia and of over 35 million Oromos only in name. Thus, despite their historical and “special constitutional interests,” the Oromo, who number between half a million and eight hundred thousand (or 20% of 4 million inhabitants of the city, UN Habitat, 2007), are marginalized and denied the use of their language. Finfinnee remains an Oromo city under a foreign occupation. Although the right of conquest was once recognized formally in international law it is no longer, yet the TPLF regime is still exercising it. As the TPLF representative has clearly, and indeed arrogantly, told the OPDO at a televised meeting in Adama recently (ETV April 14, 2013), the regime will implement the AAMP irrespective what the Oromo think (his exact word, in translation were “there is nothing you Oromo can do about it”). This statement was directed at the OPDO party members he was addressing. In plain language, he was saying that the Oromo should keep quiet; they do not have rights to land. What he meant was carried out in practice after a few days. Those who peacefully gathered to protest the AAMP were cut down in Ambo, Naqamtee, Jimma, and Haramaya by bullets, or were beaten and imprisoned. In short, the TPLF leaders were asserting an illegitimate “right of conquest” when they drew up the AAMP without consulting the very OPDO members who are legally entitled to make all decisions that affect Oromia. The leaders of the international community (the UN member states) appear to recognize the TPLF-led regime, not because it has achieved internally legitimacy, but because it exhibits the power to maintain “peace and order” in the country. Regrettably, the definition of “peace,” and the choice of the means used to maintain “peace and order” are left to the discretion of Ethiopian authorities. Oddly, what is being exercised as maintenance of peace and order by the Ethiopian regime is, by and large, accepted by the UN and its member states as “normal.” But, what may seem normal for them from distance is in reality state terrorism from the vantage point of Oromo and other peoples in Ethiopia. Yet Oromo appeals to the international community or attempts to employ legal discourse, have not managed to stop the Ethiopian regime from pursuing an antiquated “rights of conquest” at all. The Greek historian John Markakis (see his Ethiopia: the Last Two Frontiers, 2011: 284) has reminded the Oromo (particularly the leaders of the OLF) to learn from the past, and give up all expectations for external intervention on behalf of our people. The question of Oromo survival cannot wait for the time when the big powers will prioritize human rights over strategic interests and take action by going beyond the barricades of sovereignty to take action against the regime for its egregious violation of human rights. Neither can the people wait until the international community is finally repulsed by the immorality involved in the persecution of the Oromo and advocate for Oromo rights, pushing for big powers to take action. The present Oromo situation requires immediate action. That means Oromo action. I do not mean that advocates should stop presenting the Oromo cause to the international community, but that it is not enough even to ensure the survival of the Oromo as a people, let alone the achievement of their national emancipation. It is well known among observers that the TPLF leaders have been using or subverting the law to advance their interests, and that they do not respect the same law when it does not serve their purpose. Therefore, it is naïve to argue about the unconstitutionality of the AAMP with them. It is futile to expect the TPLF to honor or work to implement the provisions of their own constitution. The fact that OPDO officials and members were not informed about the Addis Ababa Master Plan until the Oromo students of Jimmaa University started to protest should not surprise us. The TPLF rules Oromia with a decision-making arrangement made of two tiers of which the upper occupied by the Tigrayans and the lower by the native conquered peoples, of which the Oromo is the largest group. The structure is hegemonic and colonial. Those who occupy the upper tier make all of the important economic and political decisions often without consulting those who are in the lower tier. The latter are made to implement the decisions irrespective of the negative impacts they may have on them and “their” Oromo constituency. That is why the few OPDO officials, such as Mr. Kuma Damaksa, the former Mayor of Finfinnee and Mrs. Aster Mammo, the Deputy Prime Minister, who might have known about the AAMP, did not inform other OPDO members until the project was ready for implementation. When the controversy broke out, both of these Oromo officials were praising the “government” as a guarantor of peace, justice and equality on the national TV, while the next day the forces of the same government were using live bullets and killing Oromo students who were peacefully exercising their democratic rights in protest. According to a political scientist from the Addis Ababa University, all the top leaders of the OPDO, including those who have ministerial positions are, in the parlance of the Oromo population, “zabanya Tigree” – “the house keepers of Tigrayans.” That is to say, they are not the protectors of Oromo rights and interests. It seems that the OPDO’s behaviour described above is changing now. It is encouraging to hear particularly about the resolution of the local Oromo police who, in many places, such as Jimma and Naqamtee, have allowed the students to continue with the peaceful protests against the AAMP – apparently refusing to take orders from the federal authorities to stop the students. It is said that some of the local Oromo police have been disarmed and dismissed from their posts for lack loyalty to the regime. It was to be expected that part of the Oromia regional police force would eventually stop serving as zabanya Tigree while the rights of the Oromo people are blatantly violated by the TPLF regime. However, as reflected in the comment of the TPLF representative at the Adama meeting on the AAMP, the regime does not care about what the OPDO think, but will proceed to implement the project as scheduled. The historian Tibebu Teshale (see his The Making of Modern Ethiopia, 1995) has pointed out that the Abyssinian state was “by and large a predatory state” that lived by looting the peasants. When one speaks about a predatory state one refers to the habits and practices of its rulers and their agents. In practice, Abyssinian rulers relate to the Oromo as predators relate to prey. The Ethiopian state has survived for more than 130 years mainly on Oromo resources. To this day, its ruling elites have failed to change the predatory behavior that characterizes their relationship to the Oromo people. They have continued to be as cruel to the Oromo as predator is to prey. Predators do not produce. They hunt, kill and consume. They survive on their prey. Predation and violence are interrelated even among humans. A robber often has to frighten or kill the owner to get his or her property. Conquerors and colonizers must suppress and intimidate the conquered or colonized to exploit their resources. The degree of violence used to exploit the conquered differs from one conqueror to another conqueror, and can vary from persuasive intimidation to violent acts that can cause the feelings of terror. Violent methods have been used by the Ethiopian rulers to control resources that belonged to the Oromo and the other conquered peoples. The TPLF regime has surpassed its predecessor in using extreme forms of violence against the Oromo to expropriate their resources. It has been using summary arrests, concentration camps, torture, extra-judicial killings and “disappearances” to terrorize them. The ongoing killings and imprisonment of students, who have voiced their opposition against the AAMP peacefully, show that the regime will terrorize the people in order to implement its projects. The leaders and members of the TPLF have benefited enormously from the use violence during the last two decades. It is common knowledge that many of the TPLF leaders and fighters, whose southward march was caused by the great Ethiopian famine of 1984-85, and who came to Oromia with empty pockets in 1991, are extremely rich today. Thousands of them have become owners of luxurious homes in Finfinnee and other cities, expensive cars, fat bank accounts and vast assets in real estate, commercial farms and businesses in record time. They could do this, because, soon after they took power by force in 1991, they expropriated banks, industrial plants, commercial farms, transport firms and travel agencies which belonged to the state (built on the resources of the southern people, primarily the Oromo) under the Dergue. Since they controlled the state, no one could question what they did with the expropriated state properties. Therefore, they had used the assets, sold the state properties to themselves, and had set up a conglomeration called the Endowment Fund for the Rehabilitation of Tigray (EFFORT) in 1995 as a holding company for an expanding group of industrial, financial and service enterprises that came to dominate the entire economy of Ethiopia. Only a few of the indigenous inhabitants are employed as laborers while the majority are cleared off the land altogether. What is also remarkable is that the majority of domestic commercial farm owners are Tigrayans. According to researchers from the Oakland Institute (OI) in California, USA, “almost all of the domestic agricultural investment lands are held by the Tigrayans” (OI, 2011: 23). Citing a regional government official in Gambella, they wrote that “75 percent of the domestic investors in Gambella were from Tigray” and that many of them “seem to have limited, if any, farming experience”, and were engaged primarily in charcoal production activities, cutting down the trees and leaving the land bare. Although detailed information is lacking, the overall situation in Oromia where the regime has leased land to 899 contractors (OI, 2011: 26) may not differ much from that in Gambella. Much of the so-called double-digit growth ascribed to the Ethiopian economy in recent years is the phenomenal increase of the assets of TPLF leaders and their supporters; it has little to do with the improvement of the living conditions of the millions famine victims who survive on international food handouts from year to year. The leaders of the TPLF and their agents are clever, not only at creating fear, but also in benefiting enormously from the terror they use, particularly against the Oromo people. The AAMP is essentially an extension of the two-decades-long profitable TPLF undertaking described above. When implemented, it will become one of the biggest sources of income for its leaders and their agents. The huge chunk of territory which the AAMP is designed to cover will be divided between the TPLF leaders, TPLF members and their supporters. It will provide them with an opportunity to invest the financial assets they have been amassing so far in new real estate that will bring them more money and power. They will also sell the land, from which the Oromo farmers are evicted to others in order to make larger amounts of money. Politically, the AAMP may also profit the TPLF regime. The income from it will, without doubt, enhance its political power. It can buy lobbyists in Washington, London, Brussels, etc. and garner diplomatic support from political leaders and opinion makers. The Amhara elites who have been critical of what they call the TPLF ‘ethnic politics’ (which recognized Oromo identity and allowed them to use the Oromo language officially) will, without doubt, support the implementation of the AAMP, albeit in silence. On the other hand, the regime has underestimated the great risk it is taking by trampling on Oromo national rights so blatantly. It has undermined the survival of the Ethiopian state it will continue to rule. To start with, through the AAMP the TPLF regime has, as its predecessors had done in the past, proved that the interest of the Abyssinian elites and the rights of the Oromo people are irreconcilable. Gains to be made by the Tigrayan leaders and their followers through the expansion of Finfinnee city are costing the Oromo their lives and livelihood. It has made the democratization of Ethiopia, which is the slogan of pro-Ethiopia Oromo parties, an illusion. The attempts by pro-Ethiopia Oromo politicians who tend to overlook the colonial history of Ethiopia and wish to build an Ethiopian state to suit Oromo interest have lost the limited relevance they may have had hitherto among some Oromos. The TPLF policy has alienated those Oromos who were sympathizers of the TPLF regime, including a section within the OPDO. This was reflected in the indignity felt and the opposition voiced by the OPDO who participated in an information meeting on the AAMP in Adama (ETV April 14, 2004). As I have discussed elsewhere (see Bulcha, Contours of the Emergent and Ancient Oromo Nation, 2011), the Gullellee Oromo lost the battle over Finfinnee in 1878 against Amhara forces led by Menelik’s cousin Meshesha Seifu because they lacked firearms. They were not supported by other Oromos. Few Oromos knew what was happening in Finfinnee. Those who knew about it might have not considered what happened in Finfinnee their business, and did not come to rescue them. But 2014 is not 1878. The Oromo have learnt from experience that what affects an Oromo community anywhere affects the Oromo as a whole. Collective memory helps a society to understand both its past, present, and by implication, to imagine its future. It is needless to emphasis here that it is the memory of past injustices and the sinister aim of the TPLF regime against the future of the Oromo nation which stirs the present opposition against the AAMP. The AAMP violates the territorial integrity and identity of Oromo and their aspiration to nationhood to live as a free and sovereign people in their homeland. Therefore, they are rallying in self-defense, not only across Oromia, but also across the globe. Rallies in support of those who are opposing the AAMP at home have been organized simultaneously by Oromo communities in over 40 cities across the world starting from Wellington in New Zealand in the east to Los Angeles in the west, and from Stockholm in the north to Johannesburg in the south. The rallies have brought together men and women, young and old, Christians, Muslims and Waqeefffataa who demand that the AAMP be stopped immediately. More than 90 percent of the tens of thousands of the diaspora Oromo who participated in the rallies are refugees displaced from their homeland by the TPLF regime during the last two decades. For them, as it is for the Oromo at home, the struggle over Finfinnee is a struggle for Oromia. The Gullallee Oromo were alone when they faced the Shawan forces in 1878. It is not the case with the inhabitants of the districts over which the TPLF regime will implement the AAMP. Their cause is the cause of the Oromo people at large. It is estimated that over the last twenty years more than 150,000 Oromos have been displaced as the city expanded. The AAMP aims to expand the city over an area of more than one million hectares affecting 10 districts and many towns. The majority of the inhabitants of these places cannot avoid eviction. Those who will manage to stay will be marginalized like present Oromo inhabitants of Finfinnee city. In addition, that the so-called Addis Ababa Master Plan is a scheme that will destroy Oromia as a territorial entity seems to be clear to every Oromo. Oromo artists, poets and political commentators described as a dagger pointed at Oromia’s heart. Territorially, the project will cut out the Tuulama highlands – which constitute the heartland of the Oromo territory – and call it Greater Addis Ababa. Figuratively expressed, the AAMP is indeed a dagger pointed at the “heart” of Oromia. The uprising which is triggered by the AAMP among the Oromo at home and in the diaspora concerns, not only the survival of Oromia as a contiguous geographical entity, but also the survival of the Oromo as a nation. It is no wonder that the Oromo youth are ready to make sacrifices and oppose the implementation of the AAMP. The project is an attack on their national identity and their future. Therefore, they are acting in spite of the danger posed to their lives by the ruthless security forces of the TPLF regime. As has been expressed eloquently in poems, songs and articles produced by Oromos at home and in the diaspora during the last three weeks, the Oromo cannot afford to leave the regime alone to implement its anti-Oromo project. To put this analogically, the AAMP has put the Oromo nation in a state which looks like the situation of a person who is threatened with a knife pointed at him or her by an assailant. Such a person must not be paralyzed by fear of death. He or she must defeat fear and fight back in order to survive. That is what the Oromo youth are doing and are also expecting from the rest of the Oromo population. For an oppressed or a colonized people, defeating fear is a crucial initial step toward liberation. It is common knowledge that it is not the first time for the Oromo to make great sacrifices in defense of their human rights, but it can be concluded that the current uprising led by the Oromo youth is the beginning of a new chapter in the struggle for the liberation of the Oromo nation. The situation demands a revolution, and what they have set in motion is a revolution for survival. The Tigrayan elites who are ruling Ethiopia today are more destructive than the Haile Selassie and the Dergue regimes had been. They are displacing the Oromo from the land of their ancestors and are selling it to outsiders. They are destroying, not only Oromo homes, Oromo communities, and Oromo lives, but also changing the demographic identity of the land the Oromo have inherited from their ancestors. The Haile Selassie regime “Amharized” Oromo place names, such as Bishoftu, Adama, etc. to Amharic names, such as Debre Zeit and Nazret. It tried, but it did not succeed in destroying the Oromo culture and language or Amharize their inhabitants. With its demise in 1974, the Oromo reclaimed their old place names, and Debre Zeit became Bishoftu and Nazret became Adama. The TPLF regime is changing the demographic (hence linguistic and cultural) identity of rural and urban Oromo territories by displacing their indigenous inhabitants. The method used by the TPLF regime is direct and brutal — it uproots and displaces the people; it kills those who oppose its plans. If the AAMP is implemented and the majority of their Oromo inhabitants are displaced, Sululta, Sabbataa, Akaki, etc. may remain as place names without the sociological, cultural and historical content they possess at present. They will lose their Oromo culture, their Oromo language and identity. They will cease to be part of the Oromo territory. By and large, that is what the TPLF regime is doing, and will continue to do by implementing the AAMP and similar projects in other parts of Oromia if the current Oromo uprising fails to stop it once for all. “Addis Ababa Master Plan” (AAMP) sometimes also known as the “Master Plan” has become the shorthand reference for government-announced Integrated Development Master Plan for Addis Ababa. The “right of conquest” has a long tradition and was accepted among states in the past. This is because it was believed that the forces of the conquering state, being by definition stronger than those who are lawfully entitled to rule the conquered territory in question, are more likely to secure peace and maintain order. That was particularly the case with European colonies in Africa, Latin America and Asia in the past. * Mekuria Bulcha, PhD and Professor of Sociology, is an author of widely read books and articles. His most recent book, Contours of the Emergent and Ancient Oromo Nation, is published by CASAS (Centre for Advanced Studies of African Society), Cape Town, South Africa, in 2011. He was also the founder and publisher of The Oromo Commentary (1990-1999). He is an active member of the OLF and has served in the different branches of the national movement since the 1970s. As I have indicated in Part One of this article, the message in the slogans of the Oromo rallies at home and abroad, among other things, is against evictions caused by land grabbing. The Oromo are evicted from their land which is being leased or sold by the TPLF-led Ethiopian regime to foreign and domestic land grabbers. The so-called “Integrated Development Master Plan for Addis Ababa,” which is generally known as the Addis Ababa Master Plan (AAMP), is part of the same scheme. Whether it is for urban expansion or commercial farming, the eviction of the indigenous landowners is conducted in the name of development. The TPLF regime is accusing the opponents of the AAMP as instruments used by “terrorist” organizations to disturb peace and oppose democracy (BBC, May 2, 2014). Although it is instigated by the AAMP, the present students uprising in Oromia is against the crimes which are being perpetrated by the TPLF regime in the name of development. In addition to the defense of Oromia’s territorial integrity and identity mentioned in the previous part of this article, the protest is against eviction and displacement inflicted upon the Oromo as well as about the environmental destruction caused by urban and rural “development” schemes of the present Ethiopian regime. As correctly indicated by the Oakland Institute (OI, 2011), land lease or land grab is a “legal” transfer of ownership rights forever. What is being transferred is the right belonging to the indigenous peoples, such as the Oromo and the Anuak. Of the 3.6 million hectares (36,000 sq.km. or one and half times the size of the state of Djibouti) of land which the TPLF regime has transferred to domestic and foreign land grabbers (up to 2011), over 1.3 million hectares (13,000 sq.km.) are located in Oromia (OI, 2011). This does not include the thousands of hectares of land leased to mining companies, such as the British company Nyota Minerals in western, and MIDROC in southern Oromia. It should be noted here that MIDROC’s Laga Dambi gold and tantalum mines and Nyota’s new concessions at Tullu Kapi (read Kaphii) cover thousands of hectares of forest and farm lands. The Addis Ababa Master Plan, which covers 1.1 million hectares of land, constitutes an additional transfer of Oromo ownership rights to others forever. It will, as the farming and mining companies have done, displace tens of thousands of Oromo households from their homes without proper compensation, which often means no compensation. The commercial farmers and the miners are not only displacing the Oromo from their lands, but are destroying the eco-system that nurtures human life. They destroy the future of the indigenous populations by cutting down forests and polluting rivers, lakes, and underground water. As expressed gleefully by Mr. Karmjeet Sekhon, the manager of the Indian company, Karuturi Global, the land lease program of the TPLF regime has opened an opportunity to foreign and domestic investors to make enormous profits. But, as revealed by reporters (see, for example, John Vidal, “Ethiopia’s land rush: Feeding the world”, March 21, 2011, Video) it has brought disasters upon communities, such as the Oromo and Anuak, who were evicted from their homes as their farm and pasturelands are leased to foreign speculators. The environmental destruction being caused as the consequence of the policy is beyond estimation. Mr. Sekhon told John Vidal, the environment editor of the Guardian, that the destruction of the forests and trees that cover much of the 300,000 hectares of land (about 3,000 sq.km. ), which his company is leasing for 50 years in Gambella, is inevitable. The owners of Karuturi Global will stay in Gambella as long as the farms bring profits. They will depart as soon as the profits start to decline leaving behind a desert-like landscape, contaminated soil, polluted sources of water and a local population who are suffering from diseases as the consequence of toxic chemicals they had dumped into the soil and sources of water to make quick profits from the farms. The disastrous consequences of land grabbing for the Oromo are reflected clearly in the rivers and lakes of the Rift Valley which are polluted by chemicals used in the flower farms and processing plants in central Oromia. Ethiopia is the second largest cut-flower exporter in Africa after Kenya. The availability of fertile land, cheap labor, free ground water and generous tax free holidays has brought hordes of land grabbers to Ethiopia starting the year 2000. In 2008, there were 814 flower plantations covering about 1,400 hectares of land, nearly all of which is located in Oromia in four clusters in the districts of Bishoftu, Sabbata, Managesha and Ziway. The first three clusters of farms are located within a distance of 30 to 50 km from Finfinnee while the Ziway cluster is about 100 km away from it. The implementation of the AAMP will evict the rest. Four in five (83%) of farmers leased land from the government and the rest rented it from private owners (Abiy Tamrat, Flower Industry Threatens Right to Water in Ethiopia, 2011). It is important to note, in connection, how land grabbing (eviction of the indigenous Oromo population) for commercial farming is overlapping with the AAMP here. A large section of the Oromo peasant households in Sabbata, Managasha and Bishoftu districts are already displaced by the flower farms. Moreover, if the AAMP is implemented, it wouldn’t be long before the districts lose their Oromo culture and language. There are tens thousands of mothers who share Amina’s tragedy throughout Oromia. Her grief and fear are shared by all mothers in Oromia and elsewhere who are victims of similar developments in their rural communities. For the Oromo communities which depend on Lake Koka, the economic consequences of pollution are equally disastrous. According to the Al Jazeera report, most of the fish in the lake are dead. The livestock are also dead. The toxic water not only kills humans, but also livestock. The government does not want to let environmental concerns to slow down its economic exploitation of Oromia. Flower farmers and factory owners are not held accountable for the pollution which their economic activities are causing. The medical workers who serve the community say the same thing. They reported thousands of people are sick and that the cause is the polluted water they drink. But the concerned authorities have been criminally negligent. Consequently, the Oromo are left hopeless and helpless against the environmental destruction and water pollution caused by the commercial farms and industries owned mainly by outsiders. It is important to note here that it is not only those who use the contaminated waters of the Awash, Mojo, Akaki rivers and Lake Koka for drinking and washing that are affected by the flower farms in question. Since proper safeguards are not provided by owners of these businesses, workers who are employed on the farms and in the packing workshops are also victims of various diseases related to the chemicals used in the plantations. In addition, since the wage they earn is far below subsistence level, workers cannot afford the medical expenses for the job-related health problems they often experience. A worker is paid about one US dollar a day which is less than the cost of a single rose in Amsterdam or Stockholm. Yet flower farming is said to be the most profitable industry in Ethiopia. According to the Ethiopian Horticulture Development Agency (EHDA, 2010), Ethiopia exported cut-flowers for US$250 million in 2010. It is no exaggeration to state that, while the Tigrayan ruling elites and businessmen, and foreign land grabbers are getting rich, the majority of the Oromo people are becoming poorer and hungrier than ever before.Gold, Ethiopia’s second largest export commodity after coffee fetched US$ 578.8 million in 2012-13 (William Davison, Bloomberg News: July 6, 2013). Following the recent discovery of large deposits of gold, particularly in western and southern Oromia, revenues from its export are expected to triple soon. However, the realization of profits and revenues from the extraction of minerals and precious metals by investors and the Ethiopian government does not benefit the Oromo people. For them, the consequence of gold mining has been eviction from their land, irreversible environmental damage and severe health problems so far. Consequently, the country’s largest gold mine at Laga Dambi in southern Oromia has been a source of conflict between the local Oromo population, on the one hand, and MIDROC Company and the Ethiopian state, on the other since 2009. Many students and members of the local population who demanded environmental protection and compensation for the damages caused by the mining companies have been imprisoned and persecuted on several occasions during the last five years (see for example Environmental Allegations generate Protest, Mass Arrest” report by the US Embassy, Addis Ababa, February 22, 2010, released by Weakileaks, August 30, 2011; Gadaa-com, Sept 15, 2011). In general, it is no exaggeration to state that the Tigrayan ruling elites and businessmen and foreign land grabbers are getting rich while the majority of the Oromo people are becoming poorer and hungrier than ever before. As noted above, public health is deteriorating and Oromia is undergoing an irreversible ecological devastation. One often hears people quoting the late Meles Zenawi who said allegedly that “a majority can be reduced to a minority and that a minority can be made to become a majority.” Whether what he meant was political influence or demographic size was not clear, but it is speculated by observers that his comment was about Oromo demography. In fact, given the intensity and multi-dimensionality of the ongoing persecutions, and the rate of displacement that is making Oromo livelihood difficult and almost impossible, the reduction of the Oromo to a minority is not surprising.A noted scholar has argued that masses of people may not be killed overnight, in a week, or in a month for genocide to occur. Small scale killings, repression, and violence that target a category of people, can develop into large scale killings and then into genocide (see Ervin Staub, The Roots of Evil: The Origins of Genocide and Other Group Violence, 1992). Human history is filled with cases where settler minorities have successfully reduced politically oppressed majorities to minorities. The white settlers in the Americas and Australia were for example settler minorities who overtime reduced indigenous majorities to insignificant minorities. In Ethiopia, the killings I have described in previous articles (see Mekuria Bulcha in Gadaa.com; or Ayyaantuu.com, May and July 2013) are signposts on the road to large scale killings unless we stop the present development in time. Genocide is committed, not only through physical destruction of a community, but also committed by imposing conditions that make the survival of its members impossible.The large scale sale of farm- and pasturelands to domestic and international farming and mining companies which are poisoning the rivers, lakes and ground waters in Oromia, and the disintegration of communities by displacing them from their ancestral homes are part of the ongoing process of destruction which the policy of the TPLF regime is inflicting on the Oromo people. The AAMP is part of the disastrous process of destruction and genocide. In 1993, John Markakis asked the late Meles Zenawi why the TPLF had abandoned the idea of an independent state of Tigray (which was its objectives in the beginning) and decided to capture political power in Addis Ababa. The TPLF leader’s answer was, “When we reached the borders of Tigray, we looked back and saw nothing there” (Markakis, Ethiopia: The Last Frontier, 2011: 192). Meles was talking about the grinding poverty that had affected Tigrayans and the dearth of natural resources of his native province. The situation is quite different today. Tigray is in no desperate need. As indicated above, the Tigrayan middle which came into being during the last two decades is the most powerful and probably the most prosperous class in Ethiopia today. The experience of the Oromo people is the opposite. They are poorer than ever before and are grossly persecuted. They are pushed to the edges and are dehumanized. As I have indicated above, they are being killed in the manner mad dogs are killed in societies that do not have respect for animal life. The ongoing student protest is an uprising in defense of Oromo humanity. It is a struggle for life worthy of human beings. In other words, his entry into business is “hassle free” because: it includes no commitment to workers’ safety or worry about environmental protection. In general, water for irrigation, whether it is drawn from underground sources, or the rivers, is free of charge. The terms of the contract signed by Karuturi Global Ltd. with the Ethiopian regime do not limit the amount of water the commercial farms can draw from the rivers and the underground water sources. Aditya Agarwal, director of the Emami Biotech company which has leased 30,000 hectares of land for oil seeds cultivation in Oromia says: “We have chosen Ethiopia for investment because of availability of cheap labour, contiguous land and congenial business environment” (OI, 2010:14). Regrettably, the policy that makes business engagement “hassle free” or “congenial” for investors in Oromia and other places in Ethiopia has filled the life of the affected people such as the Oromo with untold tragedies. As we have seen above, it has brought death to thousands of families who fetch drinking water from Lake Koka. The same can also be said about the tens of thousands of families who depend on water from the Awash, Akaki and Mojo rivers for human and livestock consumption. Karuturi’s flower farm, which is the biggest flower farm in Ethiopia, is one of the contributors to the pollution of Lake Koka. While the hassle-free and congenial policy of the TPLF regime enables domestic and foreign land grabbers to make huge profits, it denies thousands of families the basic human rights of access to food and clean water. The best fertile land on which Oromo farming communities of Ada’aa Bargaa, Akaki Basaqaa, Galaan, Shanoo, Bachoo, etc. produced food for themselves and for city dwellers in the past is leased by the TPLF regime to commercial farmers who produce cash crops, particularly flowers for export. Farmers who were food producers twenty years ago are starving beggars in town- and city streets today. I am not blaming the lucky businessmen such as Mr. Karuturi, but a regime that has betrayed the people it claims to represent. There are observers who argue that a rapid “economic growth” is taking place in Ethiopia under the current regime. They admit that it may have some negative effects on some people. But they blame its critics for not seeing what they call the positive side of the ongoing economic development. They tell us not to focus on what might have gone wrong in the process. The philosophy of the Ethiopian regime was summarized by Dr. Towldebirhan Gebregziabher, former head of the Ethiopian Environmental Protection, in an interview he gave to a BBC journalist in March 2009. He said “There is no human impact that is not felt by other species or other people. Even when you walk, you kill insects”. He was commenting the criticism directed against the construction of the Gibe III Dam by the Ethiopian regime. However, according to Terry Hathaway, director of the International Rivers’ Africa Program, “Gibe III is the most destructive dam under construction in Africa. The project will condemn half a million of the region’s most vulnerable people to hunger and conflict” (BBC March 26, 2009). My point is that the Ethiopian regime and its supporters will, as implied in Dr. Towldebirhan’s comment, trivialize the consequences of the Gibe III, as well as of commercial farming described above, for the indigenous populations as “normal”. They have little concern, if at all, about the agony felt by mothers such as Amina (mentioned above) over the loss of their children and worries about the future of their families. They tend to see the predicament of Oromo or Anuak households who are evicted from their land as given and an unavoidable aspect of what they call “development”. They do not recognize the helplessness of Oromo communities who are forced to drink water that is contaminated by toxic pollutants from the commercial farms run by land grabbers. Generally economists use Gross National Product (GNP) or the value of the final goods and services produced by a country per annum as a rough measure of economic growth, and not economic development in terms of the improvement of well-being enjoyed by ordinary men, women and children. Commercial crops that are produced for export and concrete high-rise buildings which stand amid shanty towns in a few of the cities constitute a significant part of the GDP growth reported by the media and are owned largely by the TPLF members and their supporters. It is true that Ethiopia is a veritable Eldorado for the leaders and agents of the TPLF regime and a goldmine for domestic and foreign investors such as the Karuturi Global Ltd. As aptly remarked by Mr. Karuturi, the fertile green stretches of land in Gambella and Oromia which are leased to investors is “green gold” (see, Planet for Sale – The New World Agricultural Order, Documentary produced by KAPA Presse TV, 2011). The consequence of land grabbing is the opposite for the Oromo, the Anuak and other peoples. They are denied their property rights by the Tigrayan ruling elites who have illegally made themselves the owners of all land in the non-Abyssinian regions of the Ethiopian state. It means deprivation, displacement, starvation and death. That is what the protest of the Oromo student movement is about. In general, the land policy of the Ethiopian regime constitutes a crime of a special character. That is why the Oromo students took to the streets in mass everywhere in Oromia peacefully defying live bullets fired at them by the security forces of the regime. In the context of northeast Africa, and particularly Oromia, what John Vidal has called “the deal of the century” can been seen as “the crime of the century”. What makes it such a crime is the multi-dimensional harm it is causing and will continue to cause. It is harmful to human beings and nature. It is a crime against the environment and wildlife. As mentioned above most of the fish in Lake Koka are dead and the lake itself is dying. That will be the fate of the fish and marine life in Lake Ziway and of the lake itself soon. Lake Ziway, which is 420sq.m in area and is the only large body of freshwater in the Central Rift Valley, is already affected by fertilizers used on a cluster of flower farms in the area owned by domestic and foreign contractors. A high fish mortality which is associated with effluent discharge from a flower farm is reported. Growth of algae blooms similar to that in Lake Koka is observed in the lake (Tamrat, 2011). The sparkling life-giving waters of the Akaki and Mojo rivers of yesteryears are murky poisonous morass today. Let alone drinking from them, it is repulsive and at the same time painful to look at pictures that depict them. The waters of the Awash River which sustain life in the Afar desert will soon have the same qualities unless necessary measures are taken now. As I have described elsewhere, one of the consequences of the TPLF regime’s policy is the disintegration of the affected Oromo, Anuak and other communities. The process of social disintegration is eloquently articulated by Bekele Garba (Gadaa.com – June 9, 2012, who said that in many places, land which was productive in the past is now fenced and looked after by watchmen until buildings will be erected on it. The guard often is a lonely individual, perhaps an evicted former owner of the land employed by the new owner – a land grabber. The land could be where the homestead of the watchman stood in the past. He is there alone because his family could have been disintegrated, as is often the case, by eviction. The community to which his family belonged does not exist anymore. There are tens of thousands of individuals who share the bitter experience of the dispossessed farmer depicted by Bekele Garba. The former English lecturer at the Addis Ababa University and former Deputy Chairperson of Oromo Federalist Democratic Movement (OFDM), Bekele Garba, was arrested in August 2011 and was sentenced to eight years of imprisonment for speaking the truth. He was charged of “provocation of crimes against the state and collaboration with the OLF.” Today, the regime is killing Oromo students with unimaginable impunity for speaking the same truth. It should be noted here that the Ethiopian region and the regional state of Oromia in particular, is the “water tower” of the Horn of Africa. The Awash which sustains human and animal life in the Afar region, the Wabe Shabelle, the Ganale on which the Ogaden Somali and the inhabitants of Somalia depend for water, the Baro River which flows through Gambella and drains into the White Nile, and the Mugar, Gudar, Angar, Dhidheessa and Dabus rivers which flow into the Blue Nile contribute more than 70 percent of the water it carries down to Khartoum where it mingles with the White Nile are all from Oromia. In fact, more than 50 percent of Nile water that reaches Egypt comes from Oromia. This should compel us to conclude that the threat posed by the ongoing environmental destruction in Oromia is greater than the threat posed by the controversial Grand Dam. In general, the extensive land grabbing in Oromia is a threat to the survival of the African peoples who depend on the rivers mentioned above. Therefore, it not an exaggeration to construe that the cause for which Oromo students are conducting peaceful protests all over Oromia, and for which many of them are suffering in Ethiopian prisons or are being killed by the Ethiopian security forces now, is also the cause of most of the peoples of northeast Africa. Regrettably, however, the crime being committed against them by the Ethiopian regime has been treated with indifference by the governments of the countries of northeast Africa. Needless to say that their silence, while the Oromo are being mercilessly murdered en masse, is tantamount to betraying the future of their own citizens. The regime’s notorious but futile strategy is already at work to discredit the Oromo students. 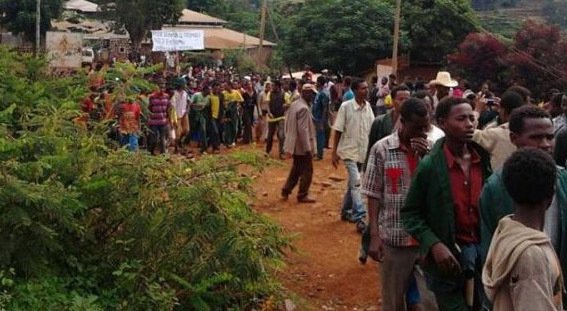 It is reported that the very people who are to lose their land to the AAMP were forced to participate in a demonstration on May 17th in support of the AAMP condemning the Oromo students as “anti-peace elements.” According to the report, a similar demonstration was organized in Robe in Bale on the 16th of May. The people are forced to“support” their own destruction. Regrettably, the role of the OPDO should be mentioned here. It is pathetic to hear the same OPDO leaders who did not have courage to press their TPLF bosses to implement what Article 49 of the Ethiopian Constitution promises the Oromo during the last two decades are now coercing the Oromo to support their enemy, the TPLF regime, to implement its AAMP and to condemn their own children who oppose it. I should add here that there are elements in the Ethiopian diaspora who, in support of the TPLF regime, will label the current protests of Oromo students as hostile against the other ethnic groups who live among them. However, the student uprising is for justice and, as such, benefits not only the Oromo but all the other peoples in Ethiopia. It exposes the lies on which the Ethiopian state is built and survives. In Hindu philosophy the greatest gift for an individual or a nation is courage or the ability to defeat fear. Courage was what Mahatma Gandhi instilled in the psyche of the Indian population to resist the British. Martin Luther King did the same with the African Americans. He persuaded them to defy the pain caused by police batons and the fangs of police dogs and continue their march to freedom. He taught them to face the white police without showing signs of fear. Indeed, the determination of the marching masses he had mobilized did not waver. His inspiring words instilled courage in their hearts and pulled thousands of them to join the historical march on Washington where they listened to the famous speech, “I have a dream” on 28 August 1963. Nelson Mandela’s role in the liberation of South Africa from the evils of apartheid is similar. For 27 years he armed the South Africans with inexhaustible courage to continue with the liberation struggle even from his prison cell on Robben Island. While Oromo political leaders have much to learn from the great leaders mentioned above, Oromo religious leaders must follow the examples which were set by religious leaders such as Martin Luther King and Desmond Tutu and preach courage from the podia in the churches and mosques. Popular resistance cannot be conducted without courage and sacrifice irrespective of the form—armed or peaceful—in which it is to be conducted. Courage is also what our community leaders must instill in the Oromo everywhere. We need to muster moral and intellectual courage to defend our rights and humanity against the TPLF regime as the Indians, the African Americans and the South Africans were armed with courage to fight colonialism and racism. Gandhi’s peaceful method may not work for us, because the British and the Tigrayans are not the same. Although the British were not happy to give up their jewel colony, India, they did not revert to systematic terror to defend their hold on it. The TPLF are unlikely to change their present position on the Oromo peacefully. The adoptability of Mandela’s approach to our situation is also doubtful for two main reasons. To start with, there were whites who fought against apartheid as members or supporters of the ANC. As bridge-builders, their contribution in making reconciliation between the white and black South Africans possible was not negligible. In the absence of their role Mandela could have not convinced his constituency to settle for a multi-racial democratic South Africa peacefully. He may have not even tried. Those type of bridge builders are not yet born in the Tigrayan-Amhara societies. Secondly, apartheid South Africa used terror to maintain white supremacy over the black population. But it was sensitive to the reaction of the world community. The TPLF leaders do not bother much about international opinion or about the human dignity of the people they oppress. Unfortunately, so far the UN and their foreign supporters do not seem bothered by their horrific human rights records. But that will not make us lose hope. In our present situation what we should adopt from both Gandhi and Mandela is their principled and consistent courage to continue with the ongoing revolution to achieve national freedom from the grip of oppression. We should stand for the truth and for what we believe in. In other words, whatever approach we will use to achieve freedom, we must be equipped with courage that targets the oppressor, and cares about the innocent bystander. The Oromo will lead a life worthy of human beings. As the Burmese winner of the 1991 Nobel Peace Prize and ex-political prisoner, Aung San Suu Kyi, has stated, among the basic freedoms to which humans aspire to lead a full and unhampered life, freedom from fear stands out. The deadliest weapon which tyrannical regimes use against their subjects is fear; they create fear in the minds of those they oppress. Writing about apartheid and its laws Steve Bantu Biko, the murdered anti-apartheid activist and leader of Black Consciousness Movement (BCM) argued, “No average black man can ever at any moment be absolutely sure that he is not breaking a law. There are so many laws governing the lives and behaviour of black people that sometimes one feels that the police only need to page at random their statute book to be able to get a law under which to charge a victim.” In other words, the laws of apartheid spread among the black population a feeling of uncertainty, fear and powerlessness.The TPLF regime has been doing in Oromia during the last two decades what the apartheid regime did before its demise. The regime made the life of millions of Oromo worse than the life of the black South Africans had been during the darkest days of apartheid. Every aspect of Oromo life is impacted by feelings of fear and uncertainty. The Oromo fear the agents of the Tigrayan rulers who can put them in prison without due process of law or make them “disappear” without trace. It is common knowledge that thousands of Oromos have “disappeared” since the TPLF took power in Finfinnee in 1991. They fear the Oromo underdogs who serve the Tigrayan rulers. Through the system called “one to five” (one person spying on five others), the TPLF has planted its “antennae” in every community, every village and homestead throughout Oromia. For an Oromo, it is difficult to tell which head, among his neighbors, is the “antenna” tuned on him or which pair of eyes that are watching him. Hence no Oromo is sure when the ever-present terror of the TPLF regime will strike him or her.Ethiopia is a country of fitesha (endless search) that turns a person, particularly an Oromo, into a perpetual suspect, a criminal by birth. An Oromo is made to fear his/her neighbours, friends, and even relatives because, forced by poverty, many honest people have joined the TPLF’s pack of informers in order to survive. The sniffing dogs of the regime are everywhere, in street corners, in work places, in schools and university lecture halls, and above all in the kebeles— neighborhoods. For an Oromo in the diaspora, Ethiopia is a country which he/she visits at the risk of causing danger to his/her relatives. It is a country where an innocent telephone call from a son or a daughter from abroad can send a father or mother to prison. It is a country which makes mothers, fathers, brothers and sisters dread to communicate with a family member who lives abroad. The Oromo struggle is about freedom from the climate of fear created by the Tigrayan regime. Oromo artist need freedom to exercise their profession. He/she needs an audience to develop his/her profession as the audience needs art that makes life enjoyable. Oromo art and scholarship must serve the progress and happiness of the Oromo people and humanity at large. Therefore, for those concerned with the development of Oromo art and culture their right place is within the battle being fought for freedom. Indeed, Oromo artists have taken the front line and are making their contributions with courage. That is also what is expected from Oromo scholars: their studies should contribute to the development of the Oromo society. The Oromo people need political independence to read what they want to read, and enjoy the music they relish without fear for being accused of narrow nationalism, terrorism or of being arrested put in jail, tortured, raped and killed. Ethiopia is a state in which the Oromo are made to fear to speak their mother tongue. They need political freedom to speak their language without fear or looking back on their shoulders fearing that someone is listening to their conversation and reporting them to the security organs of the regime just because they were “committing the crime” of talking in Afaan Oromoo. The right of speaking one’s mother tongue without worry and harassment is a human right. Needless to say here that it is not the case in Oromia even today. It may not happen at all before Oromia is free land. This may seem banal to pro-Ethiopia Oromos who will argue that this dilemma will be solved through the democratization of the Ethiopian state. In my view, those who would hope to inoculate the Ethiopian state against the hegemonic passions of the Abyssinian ruling elites with a “democratic” constitution and empty talk about justice are fooling themselves. The fact that the Oromo people have lived in fear for a long time is not a result of cowardice, but of a deep sense of powerlessness. Today, one can see that this feeling of powerlessness is rapidly changing into a simmering anger of the Oromo population and the readiness of tens of thousands of Oromo youth to sacrifice their lives for freedom. During the last twenty years, the Oromo have expressed their grievances in poetry and music. Above all Oromo music has been an expression of the popular grievance against injustice. The price paid by Oromo youth for waging the struggle has been mass expulsion from educational institutions, exile, torture and death. Many of them were beaten to death by the security agents of the TPLF as if the victims were not human beings. The list of Oromo artists who were jailed, tortured and murdered by the Tigrayan regime for their songs against injustice is very long. In short, the Oromo have learnt from experience the need for solidarity to defy terror and powerlessness. They are learning that fear and the sense of powerlessness are defeated when they act together. They have witnessed what common action can do in the so-called Arab Spring. Indeed, signs of common action among the Oromo have been increasing both at home and in the diaspora in recent years. The uprising which the AAMP has ignited is a revolutionary signpost of the trend described above. It is a revolution that needs coordination. The way it is coordinated and the goal it aims to achieve matter. The ability of the Oromo political organizations to use the currents which the uprising has set in motion, mobilize our people for a sustained struggle, and lead our nation to freedom is crucial.The uprising should be given the right direction to be effective and fruitful. It should give dividends which will benefit the Oromo as a nation. It is an opportunity that should not be wasted or misused. It should not be hijacked or exploited by political parties who are biding their time to ride back to Menelik’s palace in Finfinnee. They have nothing against the “Addis Ababa Plan” of the TPLF regime. As we all know, they will implement it with great pleasure if they get the chance.Let no Oromo organization become their Trojan horse or another OPDO. If they are wise enough, there is also an opportunity for the current members of the OPDO to abandon their subservient status under the TPLF, and join the national struggle for freedom not only to defend the right of the nation to which they belong, but even to regain the of respect of their countrymen and women. This is the time for every Oromo to get up and be counted on the side of justice and freedom.